Mexico, a country in North America bordered by United States, Guatemala, Belize, Pacific Ocean, Caribbean Sea, and the Gulf of Mexico has a total land area of 761,606 square miles and a population of over 112 Million. Mexico, an upper-middle income country, is considered as an emerging power. It has played a prominent part as a founding member of several peacekeeping organizations including the United Nations and has signed a treaty to use nuclear technology for peaceful purposes. Oil exports, tourism, agriculture and service sectors are the main sectors of its economy. It is also the largest auto producing nation of North America. Mexico is a year round tourist destination as the country has a very diverse weather system. Over thirty World Heritage Sites justify its immense popularity with international visitors. Mountains, tropical forests with exotic flora and fauna, sandy beaches, edible plants, and bull rings are the other feathers that lure visitors. 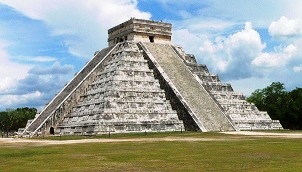 Mexico City, Cancun, Guadalajara, Acapulco, Oaxaca, and Yucatan (Chichen Itza) are well-liked places visitors descend on. Culturally, biologically and cuisine-wise Mexico lives up to its image as the melting pot of all races. Chocolate, tacos, burritos, enchiladas and tamales are recognized world over. Mexico Eyewitness Travel Guides 978-0756661830 $17 Best overall travel guide with excellent coverage of Mexico City and the Jucatan Area. Light on certain areas such as Guadalajara and Jalisco. Pictures are awesome! Mexico Travel Map by Globetrotter 978-1847733160 $9 1:3,500,000 Scale. The first stamps of Mexico were a set of five stamps released in 1856 depicting Miguel Hidalgo y Costilla. The set (Scott #1 to #5) catalogs for around $550 mint and around $310 used. Miguel Hidalgo y Costilla is considered the father of Mexico. He was a priest and the leader of the Mexican War of Independence. He was captured and executed in 1811. Varieties on the Hidalgo issue continued till 1864. The issues till the turn of the century included sets in the Coat of Arms theme, portraying Emperor Maximilian (Scott #26 to #30), Hidalgo (Scott #105 to #111 and others), and Benito Juarez (Scott #123 to #130). The early issues are all valuable with some well in the thousands. Benito Juarez was the President of Mexico from 1858 to 1872 and is credited with resisting French occupation and the establishment of the separation of Church and State. Maximilian was Emperor of Mexico from 1864 to 1867 during the Second Mexican Empire with backing from France. Mexico released a set of ten stamps in 1886 in the Numerals theme. That set (Scott #174 to #183) catalogs for around $350 mint and around $155 used. This issue was followed in 1895 by a long set of thirteen stamps in the Mail Transportation theme. The set (Scott #242 to #256) catalogs for around $1250 mint and around half that for used. The designs show letter carrier, mounted courier with pack mule, Statue of Cuauhtemoc, mail coach, and mail train. Several varieties on the same set was released until 1898. The sets and varieties are sought after by serious collectors and command a premium valuation. A set of eleven stamps released in 1910 to commemorate the centenary of Independence of Mexico from Spain. The set (Scott #310 to #320) catalogs for around $100 mint and around $20 used. The set features Josefa Ortiz, Leona Vicario, Lopez Rayon, Juan Aldama, Miguel Hidalgo, Ignacio Allende, Epigmenio Gonzalez, Mariano Abasolo, Declaration of Independence, Mass on the Mount of Crosses, and Capture of Granaditas. A set of twelve stamps released between 1950 and 1952 featuring a local theme. The set (Scott #856 to #867) catalogs for around $50 MNH and around half that for used. The designs show Modernistic Church of Nuevo Leon, Modern Building in Mexico City, Convent at Morelos, Benito Juarez, Indian Dancer of Michoacan, Stone head of Tabasco, Carved head of Veracruz, Convent and carved head of Hidalgo, Galleon and Arms of Campeche, and Francisco Madero. A set of four stamps released on September 28, 1979 in the Tourism theme. The set (Scott #1190 to #1191 and #C615 to #C616) catalogs for around a dollar MNH or used. A number of sets in the same theme have been released over the years and they form a good collectible theme. The sets are all valued in the one dollar range. Mexico receives over 22 million tourists a year and tourism contributes over 13% to the Mexican economy. The most popular attractions are the Meso-American ruins and beach resorts. A stamp released on October 12, 1987 to mark the 500th anniversary of the Discovery of America. The stamp (Scott #1519) catalogs for around $4 MNH and less than a dollar for used. The design shows the Santa Maria and the Discovery of America Festival to be held in 1992. A reissue of the same stamp (Scott #1698) on June 14, 1991 with a ‘Texpex 14-06-91’ overprint in red is more expensive and catalogs for around $50 MNH and $30 used. The first coins of Mexico were Silver Reals issued in 1823 showing the distinctive hooked neck eagle design. Prior to this, Spanish Colonial Milled Coinage (100 Centavos = 1 Peso) along with provincial coinage dominated the scene. The issues are all very valuable in high grades. Mexico has also issued a number of gold coins over the years from the early 19th century. Prior to this, the Aztec Empire used gold artifacts for religious as well as for other purposes. Bullion $10 and up Mini Gold Coins (one-tenth ounce 24k) from the 1920s start around $10. Commemorative Silver UNCs from the 1980s, Recent Silver Proofs, etc start around $50. Graded Commemorative Silver Proofs MS65 and above, Recent Silver Proof Sets, etc go into the 100s. Graded Gold Proofs go well into the 1000s. Other Coins $1 and up Common UNCs start around $1. Early 20th century issues in VF, Issues from the 1980s and prior dates in UNC, etc start around $5. Recent Commemorative Silver Proofs in low mintage, Early 19th century silver coins in VF, etc start around $50. 19th century rare issues graded MS65 and above, Rare Mint Varieties from the 19th century in VF, etc go well into the 100s. Paper Money $1 and up Recent UNCs and earlier common issues in VF start around $1. High Values from the 1960s and prior dates in UNC start around $10. UNC Banknotes from the 1910s, Rare Dates from the 1940s in UNC, etc start around $30. UNCs bundles, Rare Specimens, etc go well into the 100s. Rocks, Fossils and Minerals $5 and up Conichalcite samples from Ojuela Mine, Rough Opal Lapidaries, Tabasco Rock Crystals, etc start around $5. Amethyst Clusters, Agate Stalactites etc start around $20. Large (over 1lb) fluorite clusters, quartz and calcite crystals, natural Mexican Fire Agates (over 10ct), etc go into the 100s. Cultures and Ethnicities $10 and up Teotitlan Weaver Rugs, Talavera Crosses, Hand Painted Pottery, etc start around $10. Maya Glyph Wall Decorations, Oxacan Handcarved Curios, Gecko Lizard Clay Masks, etc start around $25. Talavera potteries, Zapotec native Indian Lord Blankets, Jemez Pueblo Pottery Bowls, etc start around $100. Antiques $10 and up 19th century maps start around $10. Vintage Inlaid Sterling Snuff Boxes, 18th century or prior maps, etc start around $40. Antique Silver Aztec Zodiac Hats and Inlaid Match boxes, Serape Wool, etc start around $100. Pre Columbian pottery, Cantera Stone Architectural Columns, etc go into the 1000s. Art $10 and up 19th century historical photos and local scenes prints start around $10. Large tourist vintage poster prints start around $25. Ceramic sculptures and plaques along with original folk art acrylic paintings start around $50.